Some dreams do become reality. When Pilot Cambrie Jarvis is rescued from an escape pod, she hides what little knowledge she has of the explosion on S. S. Desert Run. All she wants is to pilot space ships and stop dreaming. She takes a job as cook on outbound mining freighter S. S. Disco Dancer to evade questions over the space ship explosion and how she survived. After dreaming of danger to her new ship and crew, she again must decide whether to leave herself open to ridicule and testing by explaining her dream warnings, or remain silent and again hide in an escape pod until the coming accident happens, because if she dreamed it, it will happen. Ebook available US$2.99 now US$0.99 at Amazon, FREE at Smashwords, iBooks, B&N, Instafreebie and other distributors. Print version US$12.99 at Amazon and all print channels. If she dreamed it, it will happen! When Pilot Cambrie Jarvis has a dream warning of her imminent arrest and transfer to Moon Base prison, she confides in Captain Benson, owner of S.S. Disco Dancer, who suggests she board S.S. Disco Drummer and leave the system as soon as repairs are complete. While waiting for the completion of the repairs, Cam decides to help search and retrieve the bodies for burial. The marines arrive before the ship is resealed, and advise Cam will be transferred to Earth for trial for a previous space ship accident. Captain Benson argues arrest documents are not legal, but she realizes her dream warning will happen, so does not resist arrest. She just needs to figure out how to get from Earth to Moon Base while surrounded by marines. Ebook available in electronic form for US$4.99 at Smashwords, Amazon, iBooks, and other distributors. 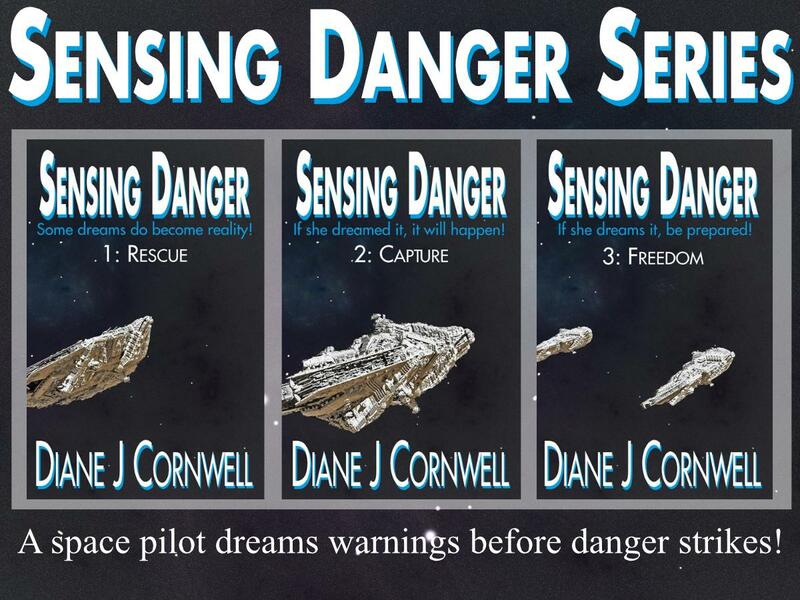 Sign up for our Science Fiction Reader’s email list and we will email you Sensing Danger 2: Capture as a gift. If she dreams it, be prepared! When Pilot Cambrie Jarvis dreams she will be shot by another pilot, she confides in Captain Benson, owner of S.S. Disco Dancer, but he doubts her warning will happen. He orders Cam to continue training and testing the two new psychic crew members, but because she kept her ability secret all her life she has no idea how to test other abilities, so suggests the navy should train the psychics, even if they insist she goes with the other psychics. Because joining the navy would be better than waiting to be shot. Ebook available in electronic form for US$5.99 at Smashwords, Amazon, iBooks, and other distributors.